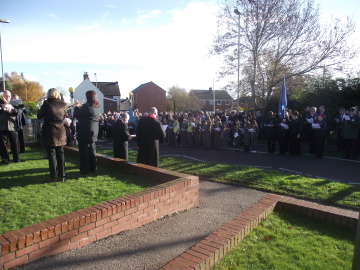 There was, as usual, a very good turnout for the act of remembrance this year. The wreath on behalf of the Parish Council was laid by a serving member of the British Forces. A full troup of Scout, Cubs, Guides and Brownies were again leading the way and were very well turned out and were very well behaved. The Ifton Colliery Band were also on duty providing the music. Rachel King played the Last Post and Reveille, it is not often that this very busy village is quiet but between Last Post and Reveille all that could be heard was the odd tweet from a bird almost in acknowledgement of those who have lost their lives so that we can be free. Nov 15 2012 was the first open evening that covered the whole school and what a very successful night it was too. The children and their parents had a torch light parade from the Ifton Heath site to the main site on the old Rhyn Park site.They enjoyed a Hog Roast, and special performance by the part of the Performing Arts side of the school. On display were proposed plans for the extension of the school to accommodate the Primary department which it is hoped to be in use by September 2014. Around 11am on Wed 3 October a male claiming to be from a water board called at a house in College Road, Oswestry, and asked to check the water supply. When the householder became suspicious, the caller was asked to leave. Neighbours reported seeing four males in the area around the time of this incident. Later, two similar incidents were reported in Belle Vue and Sutton Way in Shrewsbury. Local police alerted neighbouring forces. Once again, local police appeal to householders to refuse entry to cold callers who turn up on the doorstep without prior notice and a valid ID. Check any ID offered. A phone number for this purpose should be prominent on a genuine identification badge or document. Please report any suspicious callers to local police on 101 as soon as possible. Mrs. Alice Wilding presided at the October welcoming Mrs. Julia Griffiths as a visitor. The Christmas Party has been booked for the Hand Hotel, Chirk and members chose their menus. Nominations were made for next year’s committee. The speaker for the evening was Claire Rogers of Crumlicious Cupcakes who showed members how to make a poppy cupcake.Members then enjoyed making their own cupcake.She was thanked by Myfanwy Dulson. The competition of a wild flower arrangement in a teacup was won by Angela Rae. The exhibition of an old cookery tool was won by Shirley Willis. Jean Lunt won the mystery parcel. 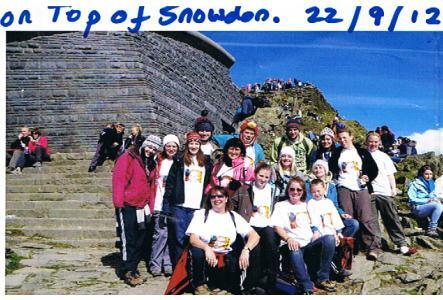 Climbed Snowdon on 22 September to help gain funds for The Histiocytosis Research Fund, her grandson, Evan died this year from this teriable condition. has been going for over three years, thanks to the help of local people. Once a month, volunteer drivers pick up elderly people and take them out to a volunteer hosts home, where everyone enjoys afternoon tea. The group meets monthly on a Sunday afternoon from 2-4. Unfortunately the group is in danger of closing as some of the drivers have had to retire. If there were just a few more people to help with the driving, the group could continue to meet. Being a driver involves using your own car to pick up one or two elderly St Martin’s residents, and going along with them to enjoy Sunday afternoon tea. The tea parties are held in the homes of local volunteers. The group doesn’t have any money to offer for petrol, but you do get to enjoy afternoon tea. Even though it’s only once a month you realise how important this small amount of contact is for people when you hear comments like this one, from Elsie who is 80 and has just joined a Contact group. If you would like to know a bit more, please ring either Liz Morgan on 01938 810635 or Hannah Guntrip on 01691 773410. Even if you can only help occasionally, whatever you can do would be very much appreciated. St Martins School formally opened it’s doors on the 1st September 2012; the first ‘all through’ school in Shropshire. This announcement follows on from two recent successes within the Secondary department. Following a glowing report in June of this year by Ofsted Inspectors judging Rhyn Park School to be a ‘good’ school with a strong family ethos, the Head Teacher is pleased to be able to announce that GCSE results are up from last year. Over 91% of our students achieved 5 + A* - C GCSE passes and a significant increase in the number of students who achieved A* and A passes. Head Teacher Nigel Keates said’ Our family ethos means that we strive to meet the individual needs of all students to ensure every student achieves the very best they can. I have been really encouraged by the obvious pride that parents, students and the wider community have taken in our achievements and I have no doubt that the new school year will see us not only looking rather different as Shropshire’s first all through school but building on these successes and making our community even more proud of their school. I would encourage students, parents and members of our local community to visit us on 9 October to see the school, students and staff for themselves’. 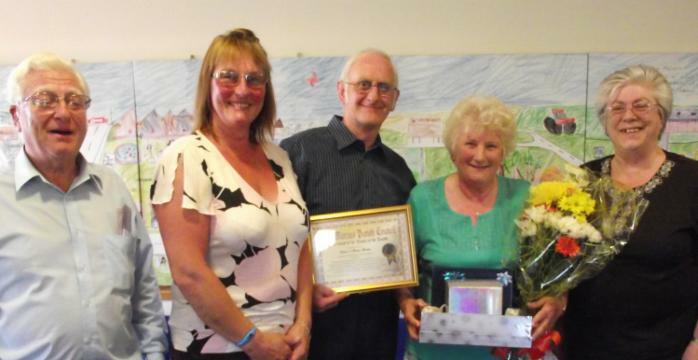 At the July meeting of the St Martins Parish Council a local couple, Pam and Dave Morris were honoured by the Council for their long service to the community. A certificate was awarded for their ‘Outstanding service to the community of St Martins’, a crystal Rose bowl and a silver photo frame. The Vice-chair of the Council Mr Neil Graham opened the proceeding, Councillor Sue Schofield read the citation on the certificate and Councillor Helen Williams presented a bouquet of flowers. Pam and Dave have owned Woodcocks Newspaper shop for many years which recently closed its doors for good. It was one of those local shops that enhanced and supported the community. There was always something for a local raffle or prize draw and always time for every customer, especially the elderly.It will never be known just how much or how many kindnesses Pam and Dave and their staff brought about through their shop but one thing is certain they will be missed in St Martins. the end of an era. There are places left on the trip to Stokesay Castle /GPS Treasure Hunt on Tuesday 21st Aug 2012 starting from the Centre at St Martins at 8:45am and returning about 4:30pm at a cost of £2. If you would like to come contact Sue Schofield on 777710 or 770204 for an application form. We need to know if you would like to go by Thursday 16th Aug so give me a ring today. Remember the Force Control Rooms are both operational 24/7, so Members of the Public can call at any time of the day or night to report what has been seen and/or heard. Mr Nigel Keates, Principal of St Martins School and Head of Secondary Phase. Mrs Nicola Bradley, Head of Primary Phase. We believe that this will ensure continuity and allow the immediate development of exciting cross phase projects. From the start of the new academic year the pupils will be involved in helping us to plan and develop our new vision, in which we will welcome the support of the whole of the community. “I believe that we have secured the very best leadership for the children and staff in St Martins School. Both Mr Keates and Mrs Bradley have a considerable amount of combined experience to draw upon. They both have a proven track record of leading change and improvement in their respective schools. They both share a deep concern for and understanding of the local community and together they share an inspiring vision for the future. I am very much looking forward to September, when the whole community will start to see their exciting plans being put into practice.” said Marion Connell, school governor. We look forward to working together to present opportunities for us to continue to build and develop this further, encompassing all pupils from the nursery through to the age of sixteen. Students and staff at Rhyn Park School are delighted following the glowing report by Ofsted Inspectors judging the school to be a ‘good’ school with a strong family ethos. Staff, students and parents felt that the school had taken a firm line with any behaviour which did not meet the high standards expected of all students. It was reported that leaders and managers modeled best practice and motivated staff and students well. Acting Head Teacher Nigel Keates said’ I am delighted that Ofsted have recognised the family ethos at the school which strives to meet the individual needs of all students to ensure every child achieves the very best they can’. Alice Wilding presided at the May meeting welcoming members of Gobowen WI. The newsletter was read. Also correspondence from West Felton WI and Ifton Meadows Committee was read..
Shirley Willis gave a report on the Spring Council meeting she attended. The speaker for the evening was Ruth Moore-Williams who entertained members in song and comedy on “The Grumpy Old Woman”. She was thanked by Shirley Willis. The competition of a funny poem was won by Pam Doyle. The exhibition of a funny holiday souvenir was won by Sue Stevens. Mystery parcels were won by Myfanwy Dulson and Vicky Crane. The evening ended with bingo. President Alice Wilding welcomed members to the meeting. The newsletter and information from NFWI was read. Alice completed a questionnaire regarding the 2015 centenary. Tickets were given out to members attending the Spring Council meeting. Mrs. Marion Evans spoke on the Linus Appeal for patchwork quilts. She then showed members beautiful examples of her work. She was thanked by Isobel Banham. The competition of a wildlife photograph was won by Pam Doyle. The exhibition of an animal ornament was won by Sue Stevens. Margaret Chapman won the mystery parcel. The evening ended with a quiz arranged by Sue Stevens. Ifton Heath Primary School and Rhyn Park School need your help! Governors and staff of both schools are working together on a Joint Strategic Committee to move forwards on the creation of the new all-through school. The school urgently needs a name and we would like everyone in the community to help. What is the best name for the new all-through school in St Martins? Academy Status bid has been rejected by Lord Hill, Under Secretary of State for Education. The letter reads 'It is about maintaining long-term provision of both primary and secondary education in the area'. Although the letter from Lord Hill says there is no right of appeal, the Governors have written to Lord Hill asking for more information under the Right of Information Act. The St Martins/Oswestry Contact the Elderly group is very popular. The group holds monthly Sunday afternoon tea parties for elderly people who live alone. Volunteer drivers pick up the guests and take them along to the home of a volunteer host where they all enjoy afternoon tea and a chat. The group is going very well, but desperately needs some help with the driving. As a driver you will pick up one or two older people and take them along to the hosts home where you can then enjoy afternoon tea with them. The hosts live around the St Martins and Oswestry area. It takes just a few hours, once a month and makes such a difference to people who would otherwise be stuck at home, looking at the same four walls. If anyone is interested in having an allotment, a new waiting list is being prepared.